The Baker Mayfield era took over in Cleveland this past season, pushing Tyrod Taylor into the rearview mirror. 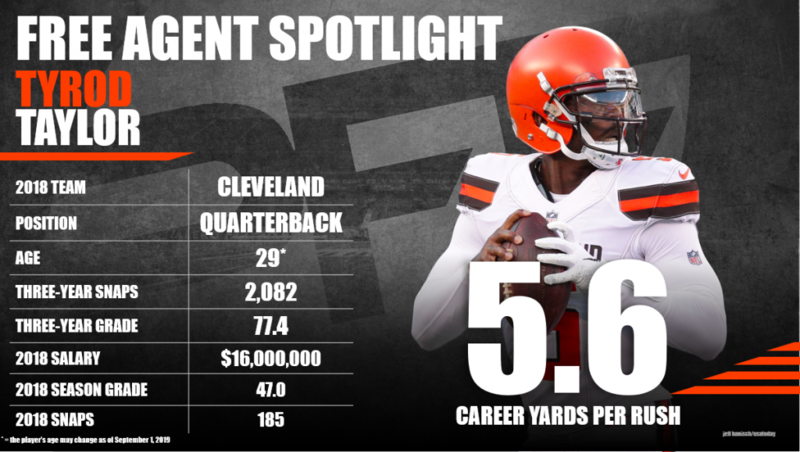 While he struggled mightily in his three starts for the Browns in 2018, Taylor still proved enough in Buffalo that he’s a value add in the NFL. Taylor earned a 75.6 overall grade or higher in all three of his years with the Bills (2015-17) and could very well replicate such production in the right system. Subscribe to Pro Football Focus’ ELITE subscription to research Tyrod Taylor’s grades, advanced stats, snaps and more in Premium Stats 2.0.